Thor #1, written by Jason Aaron, with art by Mike Del Mundo and Christian Ward, and color assists by Marco D’Alfonso, brings Thor back to his namesake, and it is pure magic. Previously, Jane Foster sacrificed Mjolnir to save Asgard, but in doing so, she gave up her power. Now, she is forced to go back to her normal life and fight the cancer that nearly killed her. This left a vacancy for a God of Thunder, and who better to fill it than the original, Thor Odinson himself? 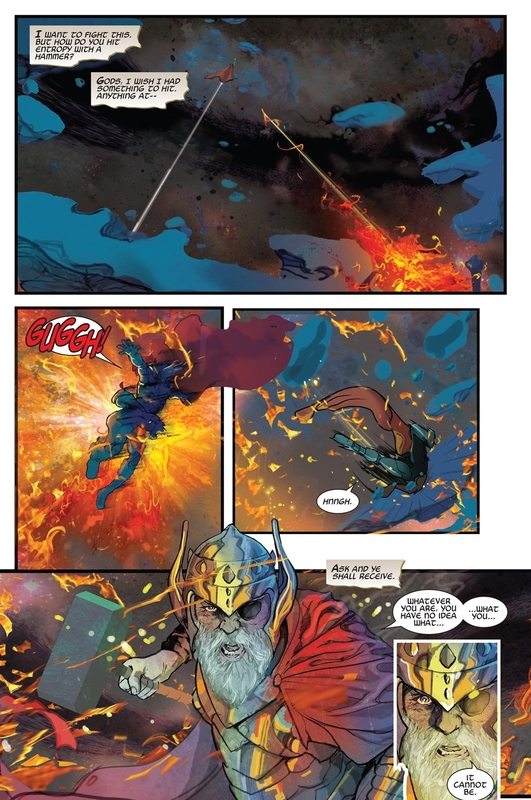 Unfortunately, Odinson still isn’t “worthy,” and even if he was, Mjolnir is gone. This leaves Thor with the task of finding a new weapon (or weapons) to take its place and return him to his former glory. In the meantime, he has a mission of finding many dangerous artifacts that were scattered around Midgard when the city of Asgardia blew up. First off, the main questions readers have been asking since they debuted Thor’s new look, including a shiny golden arm and hammer: what are they made of, and where do they come from? Those questions are not answered in this issue. The arm is simply stated to be new, so the readers can assume that there is nothing special about it, and it’s golden appearance is purely decorative. The new hammer, itself, is not even shown in this issue. However, Thor has had the dwarves hard at work on a plethora of other magic hammers, and none of them come even close to the might of Mjolnir (mostly because of a lack of pure Uru in Asgard), so assumedly, when the golden hammer makes its debut, there will be something that makes it stand out above the rest. While you’re waiting to see what exactly that stand-out quality is, you can check it out in action over in Jason Aaron’s Avengers. A disappointing lack of answers aside, this is an exciting first issue, jam-packed with action. Thor has three different fights in this book, including opponents like the Juggernaut, Namor, and Loki. Just one of these fights, alone, could have taken a full issue, but Aaron manages to place them all in a single book, and still make the pacing work, leaving plenty of room for quiet character moments. The fight scene between Thor and the Juggernaut, in which an outclassed Thor must use his new hammers to defeat his “unstoppable” foe, really is the gem of the issue. Forced to use all of his hammers, readers get to see how powerful (or not) his new arsenal is. The only downside to this amount of action in a single book is that Aaron is forced to cut the end of a couple of the fights, only telling us that Thor was successful. It’s a minor gripe, given that what’s there is more than entertaining, but it still would have been nice to see Thor barely scrape out his win against the Juggernaut or Namor. Readers are treated to another tale of future Thor in this issue as well, and it is every bit as good as the main story, which is a rarity. It centers around the older Thor having extended the life of the Earth past its natural limits, the results being that the universe is now dying around it. Instead of a one-shot story, this one looks to be an ongoing that will continue throughout the series every few issues, or so. With the cliffhanger guest appearance at the end, the audience will be sure to be hooked for the rest of the story, but it’s a shame everyone will have to wait until issue 5 for the second part. The art in this issue is perfectly suited for this kind of story. Both Del Mundo and Ward handle their stories like masters of fantasy art, and, aside from the color assist by the super-talented D’Alfonso, both of these artists completely handled all the art duties on their own. That’s pretty rare these days, as there are plenty of great inkers and colorists out there that are able to lend their talents to enhance even the best of pencils. Hopefully, this art team is the permanent one moving forward, as they are the ideal for this kind of bombastic fantasy action. As a side note, Juggernaut hasn’t looked this cool in years! Overall, if you’re the fan that’s been waiting on Odinson to reclaim his mantle, this is the book for you. He may not be back at full power yet, but Aaron is crafting a story that will eventually have Thor show how worthy he is, and the ride on the way to that goal will surely be entertaining. Not all of the answers you’ve been asking are immediately presented to you, but that is in-character for Aaron’s writing style; he likes to draw out a mystery. It was a while before readers found out Jane was the new Thor, but it made total sense when it was finally revealed. Aaron is always good for the payoff, so it’s worth sticking around for the answers.